Objective To evaluate the effect of the oral synthetic δ-9-tetrahydrocannabinol dronabinol on central neuropathic pain in patients with multiple sclerosis. Design Randomised double blind placebo controlled crossovertrial. Setting Outpatient clinic, University Hospital of Aarhus, Denmark. Participants 24 patients aged between 23 and 55 years with multiple sclerosis and central pain. Intervention Orally administered dronabinol at a maximum doseof 10 mg daily or corresponding placebo for three weeks (15-21days), separated by a three week washout period. Main outcome measure Median spontaneous pain intensity (numericalrating scale) in the last week of treatment. Results Median spontaneous pain intensity was significantlylower during dronabinol treatment than during placebo treatment(4.0 (25th to 75th centiles 2.3 to 6.0) v 5.0 (4.0 to 6.4),P = 0.02), and median pain relief score (numerical rating scale)was higher (3.0 (0 to 6.7) v> 0 (0 to 2.3), P = 0.035). Thenumber needed to treat for 50% pain relief was 3.5 (95% confidenceinterval 1.9 to 24.8). On the SF-36 quality of life scale, thetwo items bodily pain and mental health indicated benefits fromactive treatment compared with placebo. The number of patientswith adverse events was higher during active treatment, especiallyin the first week of treatment. The functional ability of themultiple sclerosis patients did not change. Conclusions Dronabinol has a modest but clinically relevantanalgesic effect on central pain in patients with multiple sclerosis.Adverse events, including dizziness, were more frequent withdronabinol than with placebo during the first week of treatment. Clinical studies evaluating the analgesic action of cannabinoidsin humans are sparse. Clinical reports indicate that cannabinoidsmay alleviate pain in different pain conditions, including multiplesclerosis related pain.21–23 Only a few randomised clinical trials are available.24–27 Three randomised studies that evaluated the efficacy of cannabinoids on different neurogenic symptoms, including pain, have recently been published.27–29 Two of these studies included patients with multiple sclerosis.28 29 A large multicentre randomised placebo controlled study including 630 multiple sclerosis patients found an improvement in pain after 15 weeks of treatment with cannabinoids (oral δ-9-tetrahydrocannabinol or cannabis extract).29 The primary outcome measure of this study, however, was spasticity, and no information was given about subtypes of pain. Another randomised placebo controlled single patient crossover study including 24 patients with neurogenic symptoms (18 multiple sclerosis patients) found that extract of whole plant cannabis (δ-9-tetrahydrocannabinol and cannabidiol)administered by sublingual spray improved pain.28 Twelve of the 20 patients completing the study had neuropathic pain. The third study included a group of patients (n = 21) with manydifferent neuropathic pain conditions (mainly peripheral neuropathicpain).27 In this randomised placebo controlled crossover study, one week of treatment with the synthetic cannabinoid CT-3 reduced neuropathic pain. None of the previous studies has specifically explored the effectof cannabinoids on pain caused by central lesions in multiplesclerosis. We aimed to evaluate the efficacy of the syntheticδ-9-tetrahydrocannabinol dronabinol on central pain in multiplesclerosis patients in a randomised placebo controlled study.The objective was to provide better treatment options for centralpain in multiple sclerosis, and we hypothesised that dronabinolwould reduce central pain in multiple sclerosis. We recruited participants from the population of patients with definite multiple sclerosis in Aarhus County, Denmark.30 We recruited patients partly from the outpatient multiple sclerosis clinic at the University of Aarhus and partly from responders (n = 627) to a postal survey undertaken among all patients with multiple sclerosis in Aarhus County in 2001.6 In the multiple sclerosis clinic two chief consultants informed eligible patients about the study. One of the investigators (KBS) interviewed by telephone the patients with pain identified through the postal survey. Patients with suspected central pain had a clinical examination in the pain clinic. Inclusion criteria were a diagnosis of multiple sclerosis (clinicaldefinite multiple sclerosis and laboratory supported definitemultiple sclerosis30), age between 18 and 55 years, and central pain at the maximal pain site with a pain intensity score ≥ 3on a 0-10 numerical rating scale. A doctor (KBS) assessed centralpain after a clinical examination. The criterion for centralpain was pain in a body territory with abnormal sensation topinprick, touch, warmth, or cold, evaluated by the bedside, or quantitative sensory testing corresponding to at least one lesion in the central nervous system.7 31 We did not include patients with musculoskeletal disorders, peripheral neuropathic pain (caused by a lesion in nerve root, plexus, or peripheral nerve), or visceral pain at the maximal pain site. We allowed concurrent spasm related pain if the patient was able to distinguish spasm related pain and central pain. We allowed additional pain outside the maximal pain site if pain intensity was low and distinguishable from the central pain. Exclusion criteria were hypersensitivity to cannabinoids or sesame oil; heart disease; mania, depression, or schizophrenia; previous or present alcohol or drug misuse; treatment with tricylic antidepressants, anticholinergic agents, antihistamine, or central nervous system depressant drugs (with the exception of spasmolytic drugs); use of analgesic drugs except paracetamol; pregnancy or lactation; sexually active women without reliable contraception; patients unable to cooperate or complete the study; participation in other clinical trials within the previous month; use of marihuana within the three months before the study; and unwillingness to abstain from the use of marihuana during the entire period. The patients consented to participate on the basis of verbal and written information. We designed the study as a randomised double blind placebo controlledcrossover trial. At study entry we obtained a medical historyand did a full neurological and physical examination, includingelectrocardiography. We allocated patients to treatment after a one week baseline period. We planned for the patients to receivethree weeks' (18-21 days') treatment with dronabinol and threeweeks' (18-21 days') treatment with placebo, with a washoutperiod of at least 21 days between the treatment periods. Anyanalgesic drug (except paracetamol) was discontinued at leastone week before the first visit. During the baseline period and the two treatment periods thepatients recorded pain intensity, use of escape medication, and adverse events in a diary. They recorded assessment of pain relief at the end of each treatment period. At the end of the baseline period and at the end of each treatment period we administered quantitative sensory tests, a health related quality of life questionnaire (SF-36), and the expanded disability status scale.32At the end of the study we asked the patients to identify thetreatment period in which they received the active medicationand which of the two treatments they preferred. We did a safetytelephone follow up three to seven days after the last visit. We administered dronabinol as 2.5 mg capsules and used dosageescalation. The initial dose was 2.5 mg daily, and the dose was increased by 2.5 mg every other day to a maximum dose of 5 mg (two capsules) twice daily. Placebo capsules were administered as identical looking capsules. The active capsules contained dronabinol solution in sesame oil, and the placebo capsules contained pure sesame oil. After 18-21 days of treatment we discontinued treatment without tapering. If adverse events occurred we reduced the dose to a minimum of 2.5 mg daily. The investigational drug (Marinol; dronabinol tetrahydrocannabinol) and placebo were manufactured for Solvay by Banner Pharmacaps, USA, and packaged and labelled by IPC-Nordic, Denmark. We assigned patients to treatment sequence by using a computer generated randomisation code with a block size of six prepared by IPC-Nordic. Investigators allocated patients consecutively by time of inclusion at the study site. Both investigators and patients were blinded. One investigator (KBS) enrolled all participants and allocated them to treatment. We administered both active treatment and placebo as white capsules(soft gelatin capsules) in identical containers. The taste andsmell of the capsules did not differ. Sealed, completely opaquecode envelopes containing information about treatment sequencefor each patient were present at the study site. The code envelopeswere returned unopened to the monitor after termination of thestudy. We maintained blinding until the data analysis was completed. The predefined primary outcome measure was median spontaneous pain intensity in the last week of treatment. Secondary outcome measures were median radiating pain intensity in the last week of treatment, pain relief, use of escape medication, patient preference, health related quality of life (SF-36), expanded disability status scale score, and quantitative sensory testing. We asked the patients to assess pain intensity and pain relief at the maximal pain site throughout the study. They assessed pain intensity by using a numerical rating scale from 0 to 10 (0 = no pain, 10 = worst imaginable pain). They made the assessment twice daily in the diary during the baseline period and throughout each treatment period. They recorded pain relief on a numerical scale from 0 to 10 (0 = no pain relief, 10 = best pain relief) at the end of each treatment period. The patients also recorded the number of paracetamol taken daily. We assessed health related quality of life by using the standard version of the SF-36 health survey. We administered the survey as an interview to all patients to avoid problems due to visual handicap. The same investigator (KBS) did all the interviews. We did quantitative sensory testing at baseline and at the end of each treatment period. We did the tests at the maximal pain site and at the same site at all three visits. We assessed tactile sensitivity to single stimuli by using Von Frey hair (Semmes Weinstein Monofilaments, Stoelting Co, IL, USA). We defined the tactile detection threshold as the smallest force needed to bend a Von Frey hair that was just perceived and the tactile pain threshold as the least force needed to bend a Von Frey hair that was just felt as painful. We used at least three changes of direction (ascending and descending forces) to define the tactile detection threshold and two crossings to define the tactile pain threshold. We measured sensation of vibration over a bony part by using an electronic vibrameter (Somedic Sales AB, Sweden). We took the average of the vibration perception threshold and the vibration disappearance threshold as the vibration threshold.33 We used the average of three vibration thresholds in the analysis. We determined the cold detection threshold, heat detection threshold, cold pain threshold, and heat pain threshold with the Medoc Thermotest (TSA 2001, Israel) by using the method of limits. From a baseline temperature of 30° C, temperatures changed at a rate of 1° C/s (cut-off limits at 50.5° C and 0° C). The patient pressed a button when he or she just felt cold, warmth, painful cold, and painfulwarmth (average of five measurements used in analysis). We assessed the pressure pain threshold by using a handheldelectronic pressure algometer (Somedic AB, Sweden) as describedpreviously,35 with a circular probe of 1 cm2 and a pressure rate of 30 kPa/s. The patient pressed a button when the pressure was just felt as painful. We used the average of three measurements in analysis. We evoked temporal summation to pinprick stimuli by repetitively tapping the skin with a stiff nylon filament driven by a computer controlled solenoid (Laboratory for Experimental Pain Research, Aalborg University, Denmark) at a rate of 2 Hz for 1 minute.36 We assessed pain intensity before and after stimulation. We considered temporal summation to be present when pain intensity increased during the stimulation. We assessed dynamic touch evoked pain by stroking the painful skin area twice with a pellet of cotton wool (1-2 cm/s). We assessed cold evoked pain by applying an acetone drop on the skin; patients assessed the pain on a 0-10 numerical scale before and after the stimulus. We considered allodynia (to dynamic touch or cold) to be present if pain was provoked or worsened by the stimulus and pain intensity after stimulation was ≥ 3. Patients used their own words to record adverse events in theirdairies during each treatment period. If a patient reported the same adverse events more than once and the events were separated by time, we considered each episode as one event. For the daily pain scale ratings we determined a median value for the third week of treatment. If a patient stopped the treatment prematurely we used the last week of treatment in the analysis according to the principle of intention to treat. We compared treatment effects (pain intensity, pain relief, escape medication, SF-36, expanded disability status scale, and quantitative sensory testing) by using Koch's adaptation of the Wilcoxon-Mann-Whitney rank sum test allowing for a possible period effect.39 We used the Hodges-Lehmann estimator (a non-parametric method linked to the Wilcoxon test39) to provide a point estimate and 95% confidence intervals for treatment effect. We used the Mainland-Gart test to analyse binary data (temporal summation, allodynia, treatment preference, adverse events). We used the Mann-Whitney test to test for a possible carryover effect. We used Fisher's exact test to compare the patients' guesses of active treatment arm. We considered P < 0.05 to be significant for the primary outcome measure. Patients were recruited to the study in the period 27 February to 21 May 2002. The last telephone follow up took place on 26 July 2002. We screened 25 patients for the study (fig 1). One patient had an abnormal electrocardiogram and was not included. All enrolled participants (n = 24) completed the study protocol. Table 1 gives the characteristics of the participants. One participant claimed that the container of study medication was empty after 15 days of treatment in both periods. We did not include the results of the SF-36 and quantitative sensory testing from this patient in analysis, because the patient ran out of treatment a week before the measurements were made. One patient had a muscle sprain (provoked by a sudden movement) on day 14 in the second treatment period (active medication). The pain due to the sprain was different from the patient's normal pain, but she assessed the intensity of this new pain in the diary. On visit 4 (on day 18) the patient was asked to assess retrospectively the intensity of her normal pain from day 14 to day 18. We used the patient's retrospective assessment of spontaneous pain in the calculation of the median pain intensity of the last week of the second treatment period. We observed no significant carryover effect for the primary outcome measure (P = 0.24). The median spontaneous pain intensity during the last week of treatment was significantly lower during dronabinol treatment than during placebo treatment (4.0 (25th to 75th centiles 2.3 to 6.0) v 5.0 (4.0 to 6.4), P = 0.02) (fig 2).The estimated difference in pain scores between dronabinol and placebo treatments was −0.6 (95% confidence interval −1.8 to 0) (Hodges-Lehmann estimator). 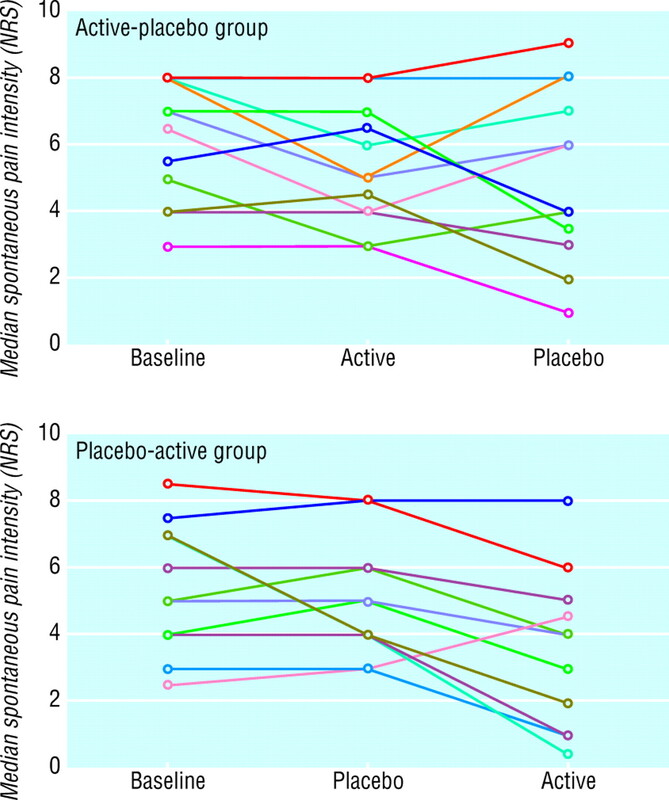 In the group of patients randomised to active medication in the first period the change in spontaneous pain intensity from baseline was −1.0 (25th to 75th centiles −1.9 to −0.1) during dronabinol treatment and 0 (−2.0 to 0) during placebo treatment. In the group of patients randomised to placebo in first period the change in pain from baseline was −1.5 (−2.8 to −0.3) during dronabinol treatment and 0 (0 to 0.9) during placebo treatment. The estimated relative difference in pain reduction from baseline between dronabinol and placebo treatments was −20.5% (95% confidence interval −37.5 to −4.5) (Hodges-Lehmann estimator). Table 2 shows the secondary outcome measures. Median radiating pain intensity during the last week of treatment was lower during dronabinol treatment than during placebo treatment, and a higher pain relief score was obtained during dronabinol treatment than during placebo treatment. On the basis of pain relief scores, the number of patients that needed to be treated for one additional case of 50% pain relief was 3.45 (95% confidence interval 1.9 to 24.8). No differences between treatments occurred in period preference, escape medication, or expanded disability status scale score. The pressure pain threshold was higher after dronabinol treatmentthan after placebo treatment. No differences between treatmentsoccurred in cold sensibility, warm sensibility, tactile detection,tactile pain detection, vibration sense, temporal summation, or mechanical and cold allodynia. On the SF-36, the patients scored slightly higher (better) in the bodily pain and mental health domains during dronabinol treatment than during placebo treatment. Adverse events were more common during dronabinol treatment than during placebo treatment. During dronabinol treatment 23 (96%) patients had adverse events compared with 11 (46%) patients during placebo treatment (P = 0.001, Mainland-Gart test) (table 3).Eleven of the patients had adverse events in both treatmentperiods; none had adverse events during placebo treatment only.The number of patients with adverse events was higher duringthe first week of dronabinol treatment than during the lastweek of treatment. During active treatment four (17%) patients had their dosesreduced (three patients to 7.5 mg daily and one patient to 5 mg daily) because of intolerable adverse events. The reduction of dose decreased the side effects for all four patients. The rest of the patients had no need for dose reduction during active treatment and were all treated with 10 mg daily. No patients had their dose reduced during placebo treatment. The most common adverse events during dronabinol treatment wererelated to the central nervous system (dizziness, headache,tiredness) and the muskuloskeletal system (myalgia, muscle weakness)(table 3). Four patients had an aggravation of multiple sclerosis during the trial—one during dronabinol treatment, two during placebo treatment, and one during the washout period. The last patient was admitted to the hospital. The washout period of this patient was extended (57 days) because of the adverse event. The head of the multiple sclerosis clinic confirmed that the patient's neurological condition was stable before the second treatment period (placebo) was started. Sixteen (67%) of the patients correctly identified the period in which they received active medication. Six (25%) patients identified the wrong period, and two (8%) patients were unable to choose one of the treatments (P = 0.19, Fisher's exact test). 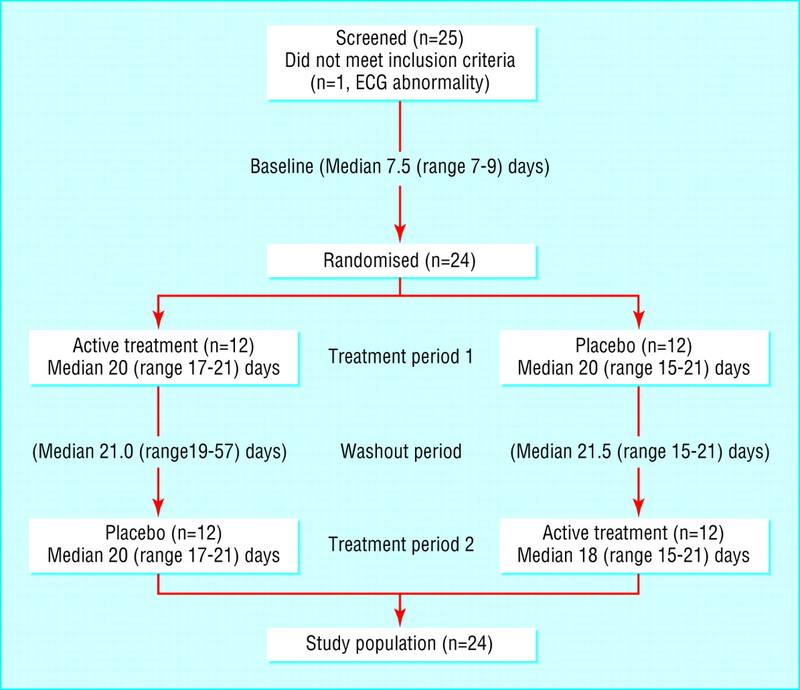 The median treatment period was 20 (range 15-21) days for both active treatment and placebo. The median washout period was21 (19-57) days. The average number of capsules taken was 62(54-72) during active treatment and 66 (56-72) during placebotreatment. Oral dronabinol, at a maximum dose of 10 mg daily, reduced central pain in patients with multiple sclerosis. The primary outcome measure—median spontaneous pain intensity during the last week of treatment—was significantly reduced during dronabinol treatment compared with placebo. The difference between treatments in pain reduction from baseline was around 21%. The intensity of radiating pain during the last week of treatmentwas also reduced, and the pain relief score was higher duringdronabinol treatment than during placebo treatment. The numberneeded to treat for 50% pain relief was 3.5. The threshold forpain provoked by pressure was slightly higher with dronabinoltreatment than with placebo. Two items of the SF-36, bodilypain and mental health, indicated benefits from active treatmentcompared with placebo. We made no statistical correction formultiple comparisons. However, the results of the secondaryoutcome measures supported the finding that dronabinol was superiorto placebo in reducing pain. The length of the treatment period may be debated. We chose three weeks as a compromise to ensure stability of the multiple sclerosis within the study period and to ensure that we were not looking at temporary effects. It could be argued that dronabinol ameliorated pain by an non-specific effect on bodily functions other than those directly linked to pain. However, dronabinol did not alter the functional multiple sclerosis disability score during the trial, and on the SF-36 general health profile the only improvements seen were in bodily pain and mental health. These observations suggest that dronabinol had a specific effect on pain. The definition of central neuropathic pain is vague.31 We included only patients with sensory abnormalities at the maximal pain site, and we did not define spasm related pain as central pain as other authors have.7 We included patients with spasms only if they were able to distinguish spasm related pain and central pain. We instructed all patients throughout the study to assess pain only at the site that was most painful at study start and only that diagnosed as central pain. In this way we tried to ensure that only changes in central pain were assessed. However, we cannot exclude the possibility that some of the pain reduction was related to a decrease in spasm related pain. In addition, the higher mental health subscore on the SF-36 during dronabinol treatment may indicate that some of the benefit of dronabinol on pain may be due to a central effect. Even when a pain reduction on the numerical rating scale is small, the patient may find the reduction clinically important. Pain relief ≥ 33% was found to be a clinically important pain outcome measure in a study that included cancer patients.45Defining a score of ≥ 3 on the 0-10 numerical rating scale as ≥ 33% pain relief, 13 (54%) patients in our study had ≥ 33% pain relief during dronabinol treatment compared with 5 (21%) patients during placebo treatment. Oral dronabinol reduced central pain in patients with multiple sclerosis. Spontaneous pain intensity was reduced and pain relief was higher during dronabinol treatment than during placebo treatment, pressure evoked pain tended to decrease, and the patients tended to score better in the bodily pain domain of the health related quality of life questionnaire. We thank chief consultants Hans Jacob Hansen and Thor Petersen at the multiple sclerosis clinic, Aarhus University Hospital, Denmark, for informing patients about the study and senior statistician Arne Andreasen for statistical support. Contributors KBS designed the study, collected data, participated in data analyses, and wrote most of the paper. TSJ initiated the study, participated in the design, and contributed to the writing of the paper. FWB initiated the study, participatedin the design, advised on data collection, participated in dataanalyses, and contributed to the writing of the paper. FWB willact as guarantor for the paper. The guarantor accepts full responsibility for the conduct of the study, had access to the data, and controlled the decision to publish. Funding The study was supported by grants from the Danish Multiple Sclerosis Society (grant no 2002/71045), grant 900035 from manager Ejnar Jonasseon and his wife's memorial grant, and the Warwara Larsen Foundation (grant no 664.28), Denmark. Solvay Pharmaceuticals provided study medication (dronabinol (Marinol) and placebo capsules), labelling, and packaging. In addition, the company provided financial support for study monitoring and data analysis. IPC-Nordic, Denmark, packaged and labelled the study medication and monitored the study. These companies were not involved in the design or execution of the study or writing the manuscript. Ethical approval The study was approved by the regional ethics committee (Aarhus, j.no.20010143), the Danish Medicines Agency (J.no.2612-170), and the Danish Data Protection Agency. Pain prevalence, severity and impact in a clinic sample of multiple sclerosis patients. Pain 1994;58: 89–93. Pain in multiple sclerosis. Arch Neurol 1984;41: 1270–2. Pain syndromes in multiple sclerosis. Neurology 1988;38: 1830–4.
. Sensory symptoms of multiple sclerosis: a hidden reservoir of morbidity. Mult Scler 1999;5: 179–83. .Acute and chronic pain syndromes in multiple sclerosis. Acta Neurol Scand 1991;84: 197–200. .Pain in patients with multiple sclerosis: a population-based study. Arch Neurol 2003;60: 1089–94. Central pain. In: Wall PD, Melzack R,eds. Textbook of pain. New York: Churchill Livingstone, 1999: 879–914. .The anti-hyperalgesic actions of the cannabinoid anandamide and the putative CB2 receptor agonist palmitoylethanolamide in visceral and somatic inflammatory pain. Pain 1998;76: 189–99. .Spinal cannabinoids are anti-allodynic in rats with persistent inflammation. Pain 1999;82: 199–205. .The synthetic cannabinoid WIN55,212-2 attenuates hyperalgesia and allodynia in a rat model of neuropathic pain. Br J Pharmacol 2001;133: 586–94. .The role of central and peripheral cannabinoid1 receptors in the antihyperalgesic activity of cannabinoids in a model of neuropathic pain. Pain 2001;92: 91–100.
. Cannabinoids attenuate capsaicin-evoked hyperalgesia through spinal and peripheral mechanisms. Pain 2001;93: 303–15. .Cannabinoid agonists attenuate capsaicin-induced responses in human skin. Pain 2003;102: 283–8. .Cannabinoids reduce hyperalgesia and inflammation via interaction with peripheral CB1 receptors. Pain 1998;75: 111–9. .A cannabinoid agonist differentially attenuates deep tissue hyperalgesia in animal models of cancer and inflammatory muscle pain. Pain 2003;103: 175–86.
. Anatomical basis for cannabinoid-induced antinociception as revealed by intracerebral microinjections. Brain Res 1999;822: 237–42. .Antihyperalgesic effects of spinal cannabinoids. Eur J Pharmacol 1998;345: 145–53. .A peripheral cannabinoid mechanism suppresses spinal fos protein expression and pain behavior in a rat model of inflammation. Neuroscience 2003;117: 659–70. .Actions of cannabinoid receptor ligands on rat cultured sensory neurones: implications for antinociception. Neuropharmacology 2001;40: 221–32. .The neurobiology of cannabinoid analgesia. Life Sci 1999;65: 665–73. Pain relief with oral cannabinoids in familial Mediterranean fever. Anaesthesia 1997;52: 483–6. .Clinical experience with nabilone for chronic pain. Pharm Sci 1997;3: 551–5.
. Analgesic effect of the cannabinoid analogue nabilone is not mediated by opioid receptors. Lancet 1999;353: 560.
. Analgesic effect of delta-9-tetrahydrocannabinol. J Clin Pharmacol 1975;15: 139–43.
. Evaluation of intramuscular levonantradol and placebo in acute postoperative pain. J Clin Pharmacol 1981;21: 320–6S. .Lack of analgesic efficacy of oral delta-9-tetrahydrocannabinol in postoperative pain. Pain 2003;106: 169–72. .Analgesic effect of the synthetic cannabinoid CT-3 on chronic neuropathic pain: a randomized controlled trial. JAMA 2003;290: 1757–62. .A preliminary controlled study to determine whether whole-plant cannabis extracts can improve intractable neurogenic symptoms. Clin Rehabil 2003;17: 21–9. .Cannabinoids for treatment of spasticity and other symptoms related to multiple sclerosis (CAMS study): multicentre randomised placebo-controlled trial. Lancet 2003;362: 1517–26. New iagnostic criteria for multiple sclerosis: guidelines for research protocols. Ann Neurol 1983;13: 227–31. ,eds. Classification of chronic pain: descriptions of chronic pain synromes and definitions of parin terms prepare by the international Association for the Study of Pain, Task Force of Taxonomy. Seattle: IASP Press, 1994. .Rating neurologic impairment in multiple sclerosis: an expanded disability status scale (EDSS). Neurology 1983;33: 1444–52. .Standardised method of determining vibratory perception thresholds for diagnosis and screening in neurological investigation. J Neurol Neurosurg Psychiatry 1979;42: 793–803. .Vibratory and thermal thresholds in diabetics with and without clinical neuropathy. Acta Neurol Scand 1991;84: 326–33. .Measurements of human pressure-pain thresholds on fingers and toes. Pain 1989;38: 211–7. .Aftersensations in experimental and clinical hypersensitivity. Pain 2003;103: 57–64. .The number needed to treat: a clinically useful measure of treatment effect. BMJ 1995;310: 452–4.
. Cross-over trials in clinical research. Chichester: John Wiley, 2002. .Lamotrigine for central poststroke pain: a randomized controlled trial. Neurology 2001;56: 184–90. .Introduction to sample size determination and power analysis for clinical trials. Control Clin Trials 1981;2: 93–113. .Anticonvulsants in central pain. Expert Opin Pharmacother 2002;3: 1411–20. .Efficacy of pharmacological treatments of neuropathic pain: an update and effect related to mechanism of drug action. Pain 1999;83: 389–400. .Controlled-release oxycodone for pain in diabetic neuropathy: a randomized controlled trial. Neurology 2003;60: 927–34. .Defining the clinically important difference in pain outcome measures. Pain 2000;88: 287–94. Safety, tolerability, an efficacy of orally administered cannabinoids in MS. Neurology 2002;58: 1404–7. .The analgesic properties of delta-9-tetrahydrocannabinol and codeine. Clin Pharmacol Ther 1975;18: 84–9.